I know this movie is a couple of years old, but I love Scott Pilgrim Vs the World. Ordinarily if a movie is based on a comic book, I think to myself “Oh, no, they are going to screw this up so bad.” But this movie is fun to watch. 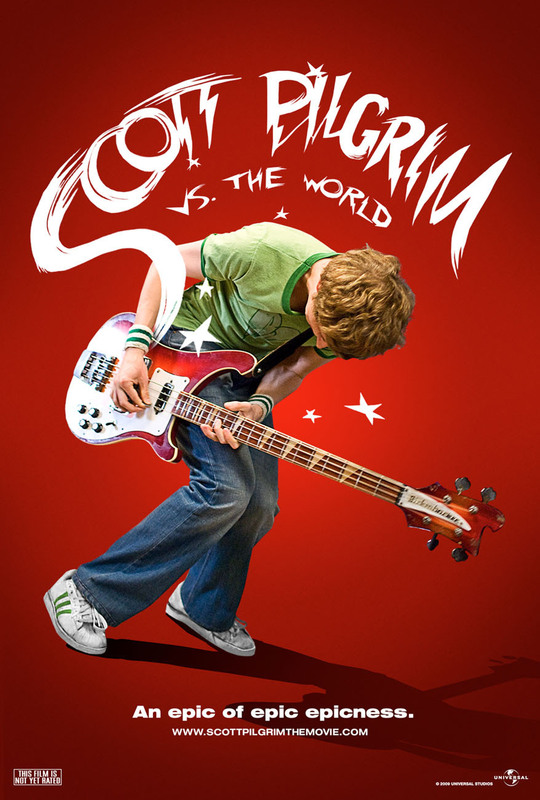 Scott Pilgrim is an ordinary guy who plays in a band. He meets a girl, and then the story takes off. He finds out that he must defeat her seven x’s in order for them to be together. Scott who is doesn’t have any superpowers, but he battles the x’s. And as the story goes on he grows as an individual. Now, why did I like this movie so much? Well, I’ll tell you. First it has a little bit of a girly feel to it. You know the self-growth love story thing. But it also has the comic book feel to it. The movie uses letters that jump out at you. I love the scene where Knives, one of Scott’s love interests, gets punched by one of the x’s. He hits her so hard that it knocks the highlights out of her hair. You can actually see the blue highlights splattered behind her. The characters are also kind of quirky. Scott has some weird fears. Like he hasn’t paid anyone to cut his hair for a year. Why? Because three hours before a girlfriend broke up with him he had his hair cut by a beautician. He believes it’s kind of connected. It’s little things like that that make the movie fun for me. I also loved the music in the movie. It features a lot of alternative bands like Blue Red Shoes, Broken Social Scene, and Metric. The music fits the movie, and it’s great to hear different bands in a movie. Since the movie is based out of Toronto, it didn’t have that Hollywood overdone feel to it. It had more of a DIY feel to it. It’s not an independent film, but it had that kind of feel. So if you’re looking for a movie that is just a little bit out of the ordinary check this one out.